Wow! There are lots-o-prizes going on in my world right now. In addition to all the great prizes up for grabs over at StampNation for our Inspiration Nation event, guess what!? Iliana, the creator of the MISTI Stamping Tool said I could giveaway a Mini MISTI! How cool is that? If you've been hanging out with me for a while, you know it took me some time to jump on the MISTI bandwagon (kinda like the foil trend bandwagon which I FINALLY jumped on this week, thanks to Deco Foil! ), but now that I have, I'm kinda hooked. Better than my experience with this Most Incredible Stamping Tool Invented is the experiences YOU all have shared with me. I've heard stories of stampers that had all but given up stamping because of physical limitations or too many stamping ooopsies! Because of the MISTI, stampers around the world are successfully enjoying this amazing hobby! AND they are brightening the days of others when they share their creations with friends and family. Another cool thing? Iliana. The creator of the MISTI. I'm proud to call her friend. Imagine…this gal that created this awesome product in her stamp room. Pretty cool, eh? 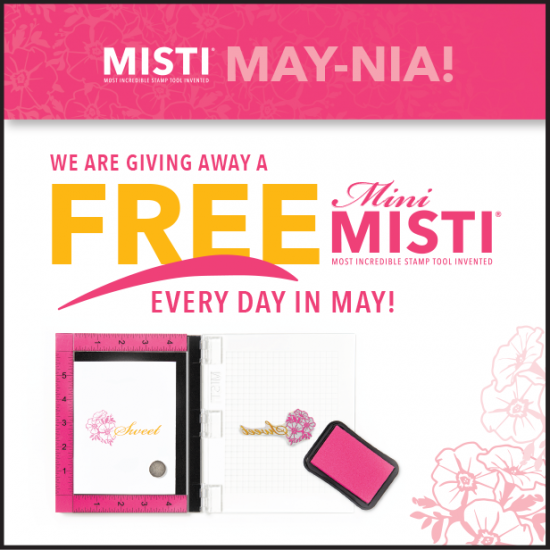 COMMENT TO WIN: Leave a comment here by MAY 12 letting me know how the MISTI makes you happy if you already have one. If you do not have one yet, leave me a note and let me know that, too. I will randomly choose one winner next week! Here are a few other places where you can enter to win…check it out!